Year 1759 (MDCCLIX) was a common year starting on Monday (link will display the full calendar) of the Gregorian calendar (or a common year starting on Friday of the 11-day slower Julian calendar). January 6 – George Washington marries Martha Dandridge Custis. January 11 – In Philadelphia, the first American life insurance company is incorporated. January 13 – The Távora family is executed following accusations of the attempted regicide of Joseph I of Portugal. January 15 – The British Museum opens (after 6 years of development). April 14 – Seven Years War – A French army defeats Ferdinand at Brunswick. June 27 – Seven Years War (French and Indian War) – British Troops under Jeffrey Amherst take Fort Ticonderoga. August 12: Battle of Kunersdorf. July 25 – Seven Years' War (French and Indian War): In Canada, British forces capture Fort Niagara from French, who subsequently abandon Fort Rouillé. July 26 – Seven Years' War (French and Indian War): At the southern end of Lake Champlain, British forces capture Fort Carillon from French, and rename it Fort Ticonderoga. August 1 – Battle of Minden – Anglo–Hanoverian forces under Ferdinand of Brunswick defeat the French army of the Duc de Broglie, but due to the disobedience of the English cavalry commander Lord George Sackville, the French are able to withdraw unmolested. August 10 – Ferdinand VI of Spain dies and is succeeded by his half–brother Charles III. Charles resigns the thrones of Naples and Sicily to his third son, Ferdinand IV. August 12 – Battle of Kunersdorf – Frederick the Great is rebuffed in bloody assaults on the combined Austro–Russian army of Pyotr Saltykov and Ernst von Laudon. This is one of Frederick's greatest defeats. August 18 – Battle of Lagos – The British fleet of Edward Boscawen defeats a French force under Commodore de la Clue off the Portuguese coast. Sept. 13: Battle – Plains of Abraham. September 10 – Battle of Pondicherry – An inconclusive naval battle is fought off the coast of India between the French Admiral d'Aché and the British under George Pocock. The French forces are badly damaged and returned home, never to return. 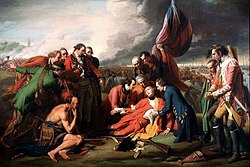 September 13 – Seven Years' War (French and Indian War): Quebec falls to British forces following General Wolfe's victory in the Battle of the Plains of Abraham just outside the city. Both the French Commander (the Marquis de Montcalm) and the British General James Wolfe are fatally wounded. November 20 – Battle of Quiberon Bay – The English fleet of Sir Edward Hawke defeats a French fleet under Marshal de Conflans near the coast of Brittany. This is the decisive naval engagement of the Seven Years' War – after this, the French are no longer able to field a significant fleet. November 20: Battle of Quiberon Bay. November 21 – Battle of Maxen – the Austrian army of Marshal von Daun cuts off and forces the surrender of a Prussian force under Friedrich von Finck. December 6 – The Germantown Union School (now called "Germantown Academy"), America's oldest nonsectarian day school, is founded. Adam Smith publishes Theory of Moral Sentiments, embodying some of his Glasgow lectures. The town of Egedesminde (modern Aasiaat) is founded in Greenland. Churton Town, the Orange County, North Carolina county seat laid out in 1754, is renamed Childsburgh in honor of North Carolina attorney general Thomas Child. It is later renamed Hillsborough in 1766. Fire destroys 250 houses in Stockholm. This page uses content from the English language Wikipedia. The original content was at 1759. The list of authors can be seen in the page history. As with this Familypedia wiki, the content of Wikipedia is available under the Creative Commons License. 90 people were married in 1759. There were 0 military battles in 1759.